The Lesser Horseshoe bat (its Latin name is rhinolophus hipposideros) is a type of European bat the size of a plum and is related to but much smaller than its cousin, the greater horseshoe bat, which is the size of a pear. 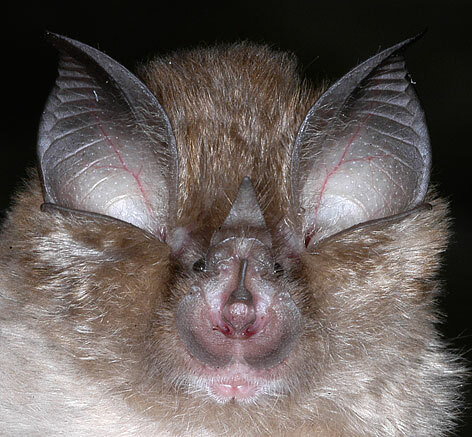 The lesser horseshoe bat is weighing only 5 to 9 grams, with a wingspan of 192–254 mm and a body length of 35–45 mm. It has strong feet that it uses to grasp rocks and branches, and can see well in spite of its small eyes. The species gets its name from its distinctive horseshoe-shaped nose which is related to its particular type of echolocation system. When roosting it hangs free with the wings more or less enfolding the body. It eats a variety of small insects including flies (mainly midges), small moths, caddis flies, lace wings and beetles. 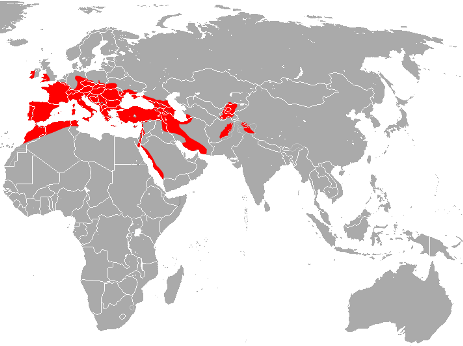 The population estimate for this species is considered to be of moderate accuracy. The lesser horseshoe bat is rare in the British Isles and is confined to Wales, western England and western Ireland. According to the Henry Schofield, pers. comm. 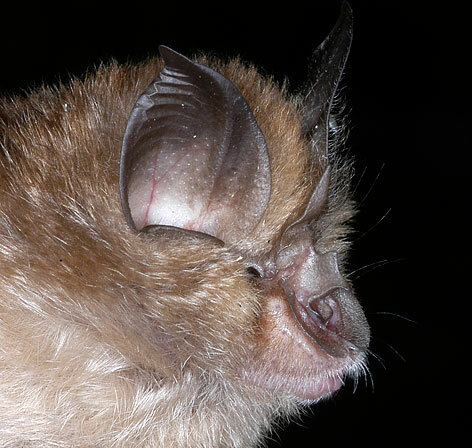 - BCT in 2008, there were 50,000 lesser horseshoe bats in the UK. Mathew & Halliwell in the same year estimated their population in Wales to be 28,000. Greater horseshoe bats Factsheet from BCT. All following images are from http://www.bristol.ac.uk/biology/research/behaviour/batlab/ and Gareth Jones' 2014 birding site: http://www.pixelbirds.co.uk/September2005.htm. Gareth Jones works at the University of Bristol as a Professor in the School of Biological Sciences. He teaches mammal diversity, evolution, bat biology and bioacoustics. His research is on the ecology, conservation and evolutionary biology of bats. 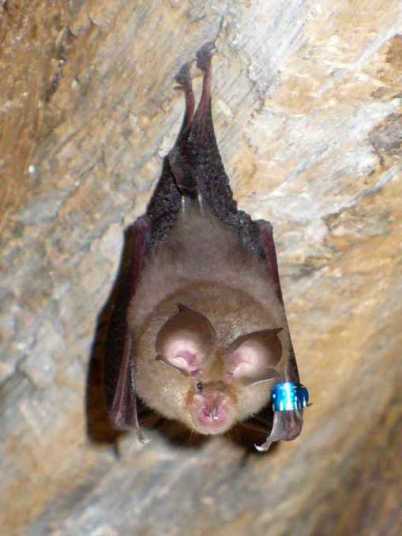 September 2005.The research team caught some lesser horseshoe bats for genetics studies from Woodchester Mansion. 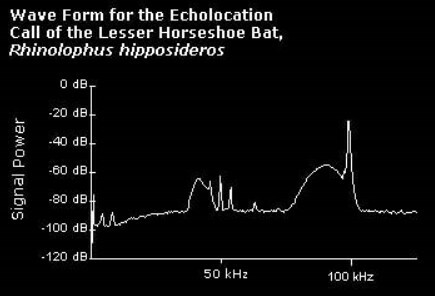 Like most bats, lesser horseshoe bats live in colonies and hunt their prey by echolocation, emitting ultrasound from specialized round pads in their mouth. How do bats get around at night, how do they avoid obstacles? How do they fly in the inky blackness inside caves, and how do they find food in the night sky? They use a mysterious sense not possessed by humans, a form of biological sonar, sometimes called "echolocation" or "biosonar". Dolphins and toothed whales (e.g. killer whales) also possess biosonar, as do some species of cave-dwelling birds, and possibly some species of shrews and seals. 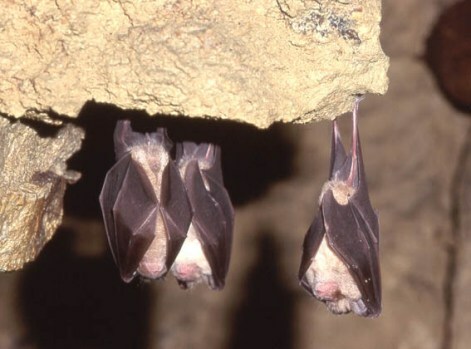 Lesser horseshoe bats have a constant-frequency (CF) component to their calls. Male bats have a lower frequency CF component than females. 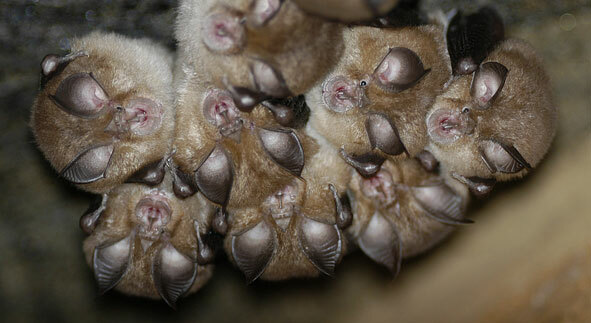 Bats less than a year old have a lower frequency CF component than older bats (Jones et al., 1992). The copyright of photos is gratefully acknowledged.